For years, I have been hounding my husband about taking a holiday to some of Europe’s wonderful Christmas markets.. This year, the pretty pleases paid off. Early on in life, my mother and aunt took me under their wings and introduced me to the wonderful world of collecting and decorating. I thereby hold them responsible for my infatuation with antiquing, Christopher Radko, textiles and arts n’ crafts. It is with good reason why Cyrille was (and should be) leery of accompanying me to the markets while possessed by the spirit of the Season and engulfed by tempting treasures at every turn. The hook finally came this year by an invitation to meet up with his great uncle and other family members in Colmar, France for their annual Christmas market spree. Ah, Prague…What a stunning city. The Paris of Eastern Europe. And once you’ve been there- you see why. Cafes, beautiful architecture, castles, cathedrals and the infamous Charles Bridge which crosses over the Vltava River. That bridge has supported passengers on it since 1357. Until the early 19th century, this bridge was the only means of crossing over from Prague Castle to the Old City. Today it is one of the main attractions in the city. During the winter months you can actually see the bridge and surrounding views that are missed during the peak summer tourism. Cyrille and I enjoyed a gorgeous first walk across the bridge at dusk. Just enough light left in the sky to capture some stunning shots like the one above. We enjoyed four-nights in Prague. A great amount of time to explore the city, sample the local beers and cuisine– pork, pork, pork! — and hit the Christmas market! We were in the city the night the Christmas market officially opened. The square was packed with people. It was like being at Rockefeller Center— well, not quite. But the streets were heaving. I had my treasure nose switched on, but try as I might, I could not find any local craft that appealed. The Czech make some stunning glassware- but, personally, I could not be bothered with travelling the next ten days with fragile glassware along with a 10-month old baby. 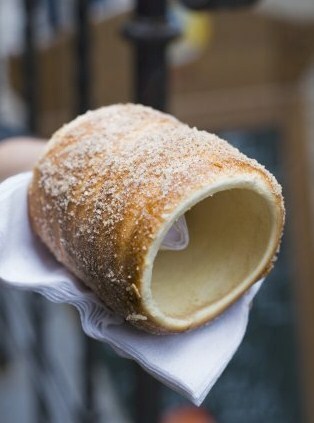 What I did discover though is the sensational trdelník. The magic behind the dough is the open fire over which it is slowly cooked. Similar to a perfectly roasted smore, you want your trdelnik to be slightly scorched. Rolled in sugar and crushed walnuts, you are handed the warm pastry in a napkin ready to be pealed and enjoyed layer by layer. A warm cup of Svařák (mulled wine) is the perfect complement to this sweetie. Standards are set by this queen of markets. On the whole, Germany is alive with the festive spirit with Christmas markets in most cities on, and off, the beaten tourist path. Nuremberg is one of the more recognised markets attracting eager shoppers and admirers from around the globe. You cannot imagine my husband’s incredible trepidation when I suggested we should go to Nuremberg. Two things he does not do well with— big crowds and Christmas. I negotiated two nights out of him…and hoped the market would live up to its expectation. And did it ever! I glowed when Cyrille thanked me after our first walk through the stands for bringing him to Nuremberg. Before allowing a chance for him to change his mind, I quickly refilled his glühwein and handed him another sausage roll. What makes Nuremberg stand out are two things: the beautiful Germanic wood craft and the gorgeous stall displays. The show stopper stand for me was found in Nuremberg at a sweet stand decorated with the most delightful collection of tins and antique toys. Two of my favourite things under one roof. Sugar and tin. Hands down: I award this stand the overall best in show, blue ribbon winner of 2011. One thing we loved at the Christmas Markets in both Germany and France was their green initiatives for the parched shoppers. On purchasing your first glass of glühwein or vin chaud you pay a deposit for mugs. These mugs are yours to be filled and refilled with mulled wine until your heart’s content. At the end of your visit, you decide: keep the mug as a souvenir or return back to any stand and get your deposit back. Brillant! Mulled wine taste better in a mug and you feel you are doing your part to naturally keep warm and save space in the landfill. Second love- adults, kids and babies can enjoy the magic of Christmas at the markets. Ouisie could not have asked for more stimulation! Lights, smells, sights and doggies everywhere! Both Nuremberg and Colmar had delightful markets designated for children with rides, toy stands, petting zoos and tempting treats. We,too, loved being kids again ourselves with rides on the carousel and gawking over the live nativities. Admit it— we all have that repressed inner child begging to be released. Just when you think France could not possibly have another beautiful region, you arrive in Alsace. We rented a car in Nuremberg and drove four hours to Colmar. Once part of Germany, we were not sure when we actually crossed the border as towns and streets still bear their Germanic namesakes. Even the food is more German than French. But one heavenly thing that is different…the regional beverage. We two wine-os were very happy to trade in our steins for stemware. The landscape is rolling hills and mountains blanketed in vineyards. Beautiful in winter and must be breathtaking at the hight of the harvest season. The part that stood out the most in Alsace were all the beautiful surrounding villages. It was refreshing to find their high streets alive and thriving. So many of the quaint villages in the UK are diminishing as store owners can no longer afford the high street rental fees and consumers are shopping at the commercial brands. All of Alsace was decorated for Christmas and each village took great pride in decorating their high street and store fronts for the season. The village of Ribeauvillé and Kaysersberg are both classified as ” la plus belle ville du monde” and for sound reason. They look as though they have been cut right out of a Brothers Grimm fairy tale! Colmar’s market rivals Nuremberg in size and splendour. The upside of Colmar’s market is that its five markets are dispersed allowing you to explore and meander the whole city rather than just one central location. Take the market away and Colmar, on its own, is a delight. Listed buildings from the 14th and 15th century are still in use today by boutiques and restaurants. The contrast of modern and old architecture live side by side and evolve together. If anyone needs another reason to love France…. go to Alsace. While I did not find the local craft as appealing as that in Nuremberg, the local savouries and sweets made up for the lack of knicknacks. Here I rediscovered my affection for pain d’épices. Alsace is definitely a place we would go back to again and again. It is quaint, timeless, and delicious. Ouisie was a star traveller. Not even a nasty cold held her back from having fun and taking in the sites. Planes, trains and automobiles…. four countries…. in eleven days…. all at ten months of age. Not bad for a first Christmas, I’d say? Alas, every girl has her limit. And ours definitely shopped ’til she dropped. I loved reading this. Thanks for sharing your adventures. I needed a few minutes away from Memphis!